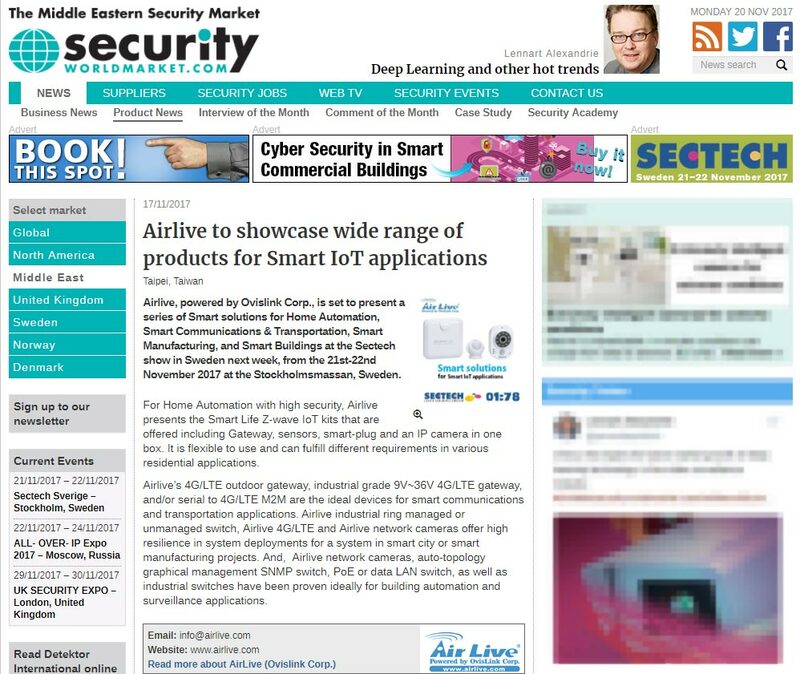 AirLive, powered by Ovislink Corp., is set to present a series of Smart solutions for Home Automation, Smart Communications & Transportation, Smart Manufacturing, and Smart Buildings at the Sectech show in Sweden next week, from the 21st ~ 22nd November 2017 at the Stockholmsmassan, Sweden. For Home Automation with high security, AirLive presents the Smart Life Z-wave IoT kits that are offered including Gateway, sensors, smart-plug and an IP camera in one box. It is flexible to use and can fulfill different requirements in various residential applications. AirLive's 4G/LTE outdoor gateway, industrial grade 9V ~ 36V 4G/LTE gateway, and/or serial to 4G/LTE M2M are the ideal devices for smart communications and transportation applications. AirLive industrial ring managed or unmanaged switch, AirLive 4G/LTE and AirLive network cameras offer high resilience in system deployments for a system in smart city or smart manufacturing projects. And, AirLive network cameras, auto-topology graphical management SNMP switch, POE or data LAN switch, as well as industrial switches have been proven ideally for building automation and surveillance applications.